The Passaic Valley Athletic Department is very excited to continue using our online forms system. Most forms will now be submitted online, eliminating the need to print, complete and fax certain forms back to our office. The main menu (listed at the top of the page) contains the categories with the forms listed as sub-menus. Complete all required forms in their entirety. After submitting, you will receive an email with information for your records. If you have questions or experience difficulty, use the contact information that follows. **Registration for Fall 2016 opens on June. Registration for the Winter opens in late October and the registration for the Spring Season opens in February. Required forms are mandated by the New Jersey high school athletics governing body, the NJSIAA. The exact forms supplied on the site need to be utilized to expedite the eligibility process. Do not use any form for the pre-participation physical other than the one posted here. All of the required forms necessary for participation can be electronically submitted, except the medical forms Part A and Part B. Student athletes must have a current physical (within 365 days), on file in the nurses’ offices in order to participate in school athletics. The medical forms must be submitted via hard copy only. 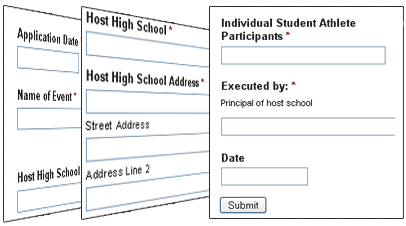 This includes the New Jersey Department of Education Part A and B Forms. PART A, THE HEALTH HISTORY UPDATE MUST BE SUBMITTED EVERY SEASON THAT AN ATHLETE PARTICIPATES OR THEY WILL NOT BE CLEARED. All forms must be submitted to the Student Activities office, who will then forward medical forms to the nurse for clearance. The State of New Jersey has adopted a new component related to physicians who are conducting athletic physicals for high school students throughout the state. Beginning with the 2016-2017 school year, the State of New Jersey has mandated that the examining physician for an athletic physical must complete a Student-Athlete Cardiac Assessment Professional Development Module prior to administering the physical. On the new state physical form that we have on this site, there is a sign-off that the examining physician must complete, to certify that they have completed this module. Be advised, all parents/guardians who have a child that will be will be participating in our athletic program, must use a personal physicians who has completed this module. If the physical is done by the Passaic Valley school doctor, he has met this requirement. Below we have included a link, which you may want to forward to your physician. Athletic physicals that are in place and will not expire for another season need not conform to this mandate, however, the next physical filed with the school for athletic participation will not be accepted without physician verification of module completion. Two copies of an emergency card per athlete will be required for participation. The emergency cards will be distributed by the coach during the first week of practice. These should be returned to the coach, who will forward one copy to the trainer.